The company has now evolved into a full scale commercial and residential landscape firm. Offering both residential and commercial maintenance, landscape design, installation, and irrigation services. Our multi-disciplinary expertise, personal commitment, service, and attention to detail, allows us to deliver projects that maximize the long term value and beauty of your investments. Altered Grounds will carefully perform an analysis of your needs and respond to each detail of your requirements, offering value added advice and guidance at each stage of your project. Our cost proposals are detailed to the smallest considerations, assuring you the most favorable quotes with value-added solutions for your landscape and site project objectives. Our success is a reflection of our experienced staff. Our integrated team consisting of design and project management support staff coupled with professional craftsmanship and service creates efficient and effective projects that are completed on a timely basis. • 5 years as a Project Manager for a Residential Landscape Construction Co.
• 3 years as Landscape Manager at Four Seasons Resort and Spa Dallas. • Eric is directly involved establishing and maintaining client relations. He is the lead designer, and is involved in all aspects of business operations. • BS in Business Administration and minor in Management from Southern Illinois University. 2-time All-Region player for the SIUE Men’s Soccer team. • Enjoys playing soccer, golf, fishing, and skiing. • 6 years working as a manager of a tree farm. Involved in initial start-up, propogation, layout, and planting of 1000's of Flowering and Deciduous Trees. • Matt is directly responsible for managing the day-to-day operations of the business. He manages both the installation and maintenance crews. Matt is also involved in project design, and has developed strong relationships with our current clientele. • Matt is an experienced singer/songwriter who enjoys writing and playing music in his spare time. He also enjoys hunting, golfing, fishing and the outdoors. • Spent 15 years in the Golf Course Maintenance Industry as an Assistant and Superintendent at various courses in Arizona, South Carolina, and Pennsylvania. • Chris is the newest addition to the Altered Grounds team. Chris’ background in the turf grass industry make him a perfect fit to manage the maintenance division. His resposibilities include time management of crews, managing fertility and pesticide programs, and quality control. • BS in Turfgrass Science from Penn State University. • Chris is an avid golfer. He also enjoys fishing, camping, soccer, and spending time in the mountains. Javier has over 14 years of experience in the landscape and nursery industry. He spent 3 years working for a large plant grower in South Texas. He also spent 7 years with various landscape companies doing maintenance. He is an expert shrub and tree pruner, and is constantly getting complements from our clients. Javier is a key member of the team and will play an important role as the company grows. Fernando has been in the landscape industry for over 12 years and has seen it all. He has been on the landscape team at the Four Seasons Resort Dallas for most of those years. Fernando has vast experience in shrub and tree layout, as well as installation. He is a key component in managing projects, coordinating and communicating with staff. Fernando has developed into the leader of the installation crews. Fernando has honed his skills in masonry, and has an exceptional eye for detail. 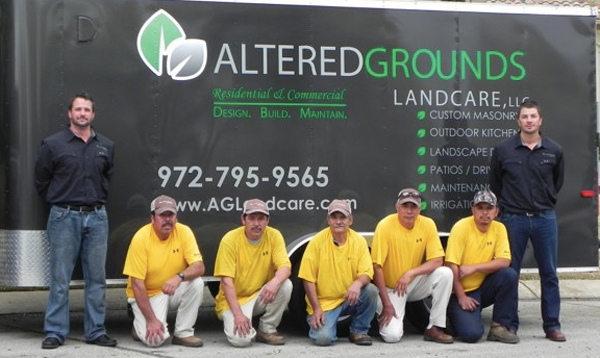 Fernando has been with Altered Grounds for 4 years and his experience is invaluable to the company. Pedro has 15 years within the landscape field. He spent his first 5 years working as a laborer with a landscape construction company. His jobs included general maintenance, and eventually Pedro rose to a bricklayer. His next 10 years were spent on the crew at the Four Seasons Resort, where he honed his skills pruning and shaping the hedges around the resort. Pedro has also been with Altered Grounds for the past 4 years and his hard work and dedication are an example to the rest of the team.